For courses in introductory business. Better Business introduces the business content readers need--in a better way. By presenting the material in a stimulating, conversational, question and answer format, the text encourages readers to engage more fully with the material. 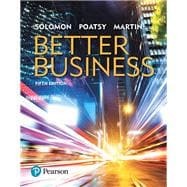 Throughout the text, unique features illustrate positive and negative outcomes of relevant business ventures, while “Mini Chapters” focus in on key topics in business. The 5th Edition continues to feature updated social media strategies and technologies, reflecting the explosive growth of social media in the contemporary business environment. With Better Business, readers have a powerful learning tool that captures the evolving issues and opportunities of business. MyLab™ Intro to Business is an online homework, tutorial, and assessment program designed to work with this text to engage students and improve results. Within its structured environment, students practice what they learn, test their understanding, and pursue a personalized study plan that helps them better absorb course material and understand difficult concepts. Note: You are purchasing a standalone product; MyLab Intro to Business does not come packaged with this content. Students, if interested in purchasing this title with MyLab Intro to Business, ask your instructor for the correct package ISBN and Course ID. Instructors, contact your Pearson representative for more information. Michael R. Solomon is Professor of Marketing and Director of the Center for Consumer Research in the Haub School of Business at Saint Joseph’s University in Philadelphia. He also is Professor of Consumer Behavior at the Manchester School of Business, University of Manchester, United Kingdom. Michael’s primary research and consulting interests include consumer behavior, branding, and marketing applications of virtual worlds. He has written several textbooks and trade books; his Consumer Behavior text is the most widely used in the world. Michael often speaks to business groups about new trends in consumer behavior and marketing strategy. Mary Anne Poatsy is a senior adjunct faculty member at Montgomery County Community College, teaching various business, management, and computer application and concepts courses in face-to-face and online environments. She holds a BA in Psychology and Education from Mount Holyoke College and an MBA in Finance from Northwestern University’s J. L. Kellogg Graduate School of Management. Mary Anne has been teaching since 1995 at a variety of elementary and secondary institutions, including Gwynedd Mercy College, Montgomery County Community College, Muhlenberg College, and Bucks County Community College, as well as training in the professional environment and presenting at several conferences. Before teaching, she was a Vice President at Shearson Lehman Hutton in the Municipal Bond Investment Banking Department. Kendall Martin has been teaching since 1988 at a number of institutions, including Villanova University, DeSales University, Arcadia University, Ursinus College, County College of Morris, and Montgomery County Community College, at both the undergraduate and the graduate level. Kendall’s education includes a BS in Electrical Engineering from the University of Rochester and an MS and a PhD in Engineering from the University of Pennsylvania. She has industrial experience in research and development environments (AT&T Bell Laboratories), as well as experience with several start-up technology firms. As a full associate professor at Montgomery County Community College, she presents nationally on topics of entrepreneurship, student engagement, and technology in the classroom.